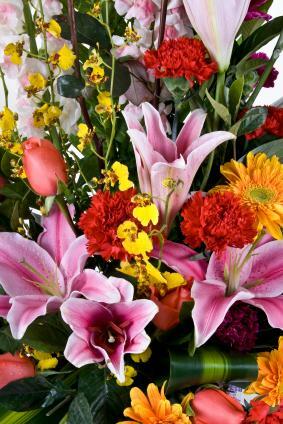 Funerals can be emotionally exhausting, and many people feel overwhelmed at the prospect of having to write individual thank you notes for all the funeral flowers. A little practical advice can help you write heartfelt words to express your gratitude. Your relationship with the giver(s) of the flowers will determine the overall tone of your message. Regardless of whom you're thanking, try to make the note personal to them so they know you truly noticed their thoughtfulness. Do You Need to Send Thank You Cards to People Who Send Sympathy Notes? You can be much more personal when you're thanking family members for their flowers. have you there, and I know Vern would have felt the same way. The following note is suitable for a close friend. Thank you so much for coming to Bill's funeral. whenever I look at them. me through this difficult time. Thanks for being such a good friend. Thanking your neighbors is similar to thanking a friend. Bailey would have loved the sunflowers you sent to the funeral. and I'm so glad to have your support. For a more formal relationship, the following note will be acceptable. to the funeral home for my mother's funeral. many of the flowers mother enjoyed. The following style note would work well when thanking the deceased's coworkers for an arrangement. Once you have written the thank you note, you are ready to send it. Place the card in a matching envelope. If the card was from a family, address it accordingly. For an example, if Mr. and Mrs. Smith signed the flower card and included the names of their three children, be sure to address all names that were listed on the card. For a family, you can write Mr. and Mrs. Smith and Family on the envelope. 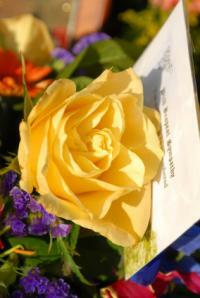 If five people's names are on the card that came with the flowers, thank each of them, mentioning them by name. These might be colleagues who have joined together to purchase an arrangement of flowers. Make sure you include all of their names on both the inside of the card and when addressing the envelope. Don't try to write all of your thank you notes at once. If you have a number of cards to write, just plan to send two or three a day. You have just lost a special person in your life, and no doubt, your emotions will be raw. Surround yourself with friends and family who will support you as you take care of the many tasks in front of you.